Olympic curler and Madison, Wisconsin native, Matt Hamilton, has been a social media sensation during the 2018 Winter Games. But now, the Mario lookalike who throws a football like Aaron Rodgers before matches and chugs a beer after , is taking his online presence to new heights, inspiring the creation of an entire militia thanks to his impressive mustache. 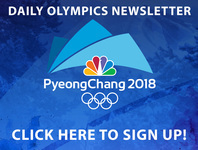 Fellow Olympians and men from all over the United States are shaving their beards and showing off their mustaches in support of Hamilton and the rest of the Olympic men's curling team in South Korea. Even entire families are getting in on the action. The support of the public back home has certainly helped the team in terms of success. After starting the games 2-4, the team stormed back to win four straight--including a semifinal defeat of Team Canada--and make the gold medal match against Sweden. They are the first ever USA Olympic curling team to ever make it to a gold medal match. Team USA's captain Jon Shuster, a Superior, Wisconsin native, said their team was inspired by the Women's hockey team's historic defeat of Canada. Those players “showed us that, you know, anything is possible,” he said. But to watch the game, you'll have to either groom or stick on your mustache after brewing a large pot of coffee or chugging an energy drink. It airs live on NBCSN at 2 AM.